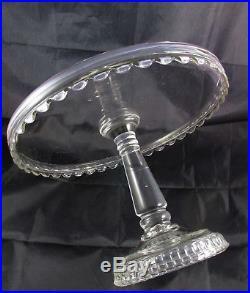 Rare HTF Extra Large Huge Antique EAPG Clear Glass Pedestal Cake Stand Plate. 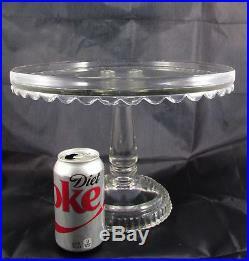 I have never seen a pedestal cake stand this tall or large before! Nice drape on edge and column like pattern around the base. Rum rim around top edge. 9 1/4" tall x 13" diameter - would hold a 12 1/4 diameter cake! Excellent Condition - no chips, cracks or repairs. The items you see are antiques & vintage and have an expected amount of wear from normal use and is not a reason for a return. We offer a great selection of antique and vintage items from the 1880's to the 1950's. We try very hard to carefully describe and picture any damage or repairs, please take the time to read the entire description and view all the pictures. 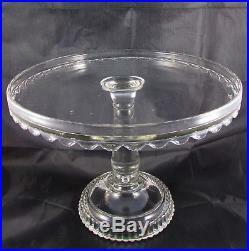 The item "Rare HTF Extra Large Huge Antique EAPG Clear Glass Pedestal Cake Stand Plate" is in sale since Thursday, February 22, 2018. This item is in the category "Pottery & Glass\Glass\Glassware\EAPG Pattern Glass 1850-1910\Other EAPG Patterned Glassware". The seller is "circaelm" and is located in Lombard, Illinois. This item can be shipped to United States, Canada, United Kingdom, Denmark, Romania, Slovakia, Bulgaria, Czech republic, Finland, Hungary, Latvia, Lithuania, Malta, Estonia, Australia, Greece, Portugal, Cyprus, Slovenia, Japan, China, Sweden, South Korea, Indonesia, Taiwan, South africa, Thailand, Belgium, France, Hong Kong, Ireland, Netherlands, Poland, Spain, Italy, Germany, Austria, Russian federation, Israel, Mexico, New Zealand, Philippines, Singapore, Switzerland, Norway, Saudi arabia, Ukraine, United arab emirates, Qatar, Kuwait, Bahrain, Croatia, Malaysia, Brazil, Chile, Colombia, Costa rica, Dominican republic, Panama, Trinidad and tobago, Guatemala, El salvador, Honduras, Jamaica.